I enjoy these reminders that artists can say, with a visual surprise, what a lecture or a formal protest cannot. Although other forms of activism and social change leadership are important, artists like Front 404 surprise us into seeing, when we might not self-select to be in an audience or tune out as we rush past a protest. The humor and simplicity of this kind of artistic leadership (see laughtevism about its power to change election results!) is visionary leadership at its creative best. And thank you, 100days blogger, for bringing so many varied ways civil disobedience is a creative force for different kinds of leadership! 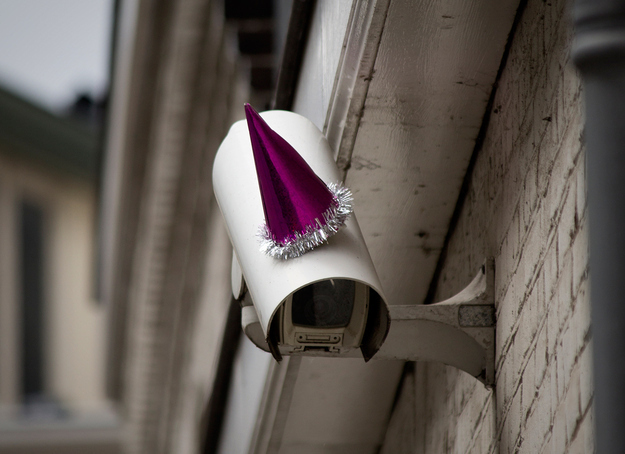 Dutch artist duo Front404 decorated security cameras with party hats in one of the Netherland’s largest cities to celebrate George Orwell’s 110th birthday.